Prepare your fire safety and response plan with this handy checklist from US Equestrian sponsor Markel Insurance Company. If you ask a group of horse owners what safety issue scares them the most, a large number will tell you it’s the threat of a barn fire. There is nothing more devastating than losing horses and other animals in a fire. While there are things outside your control that could cause a fire (like lightning), there are measures you can take to prevent fires or lessen their impact. This is not meant to be an exhaustive list, nor will following this protocol ensure you will never have to deal with such a tragedy. It is merely a checklist of things you should consider. Make the plan known to everyone: boarders, employees, visitors, etc. Post the plan in a conspicuous place where people can see and read it. Review it periodically, and update it as needed. The plan should be for humans and horses. Make sure your address is clearly marked and visible at night at the property entrance. Use reflective signs that can be seen at the road. Make sure your driveway is at least 12’-14’ wide, clear of debris and cleared to 13’6” overhead to allow for emergency vehicles. Identify the nearest water source. Know where emergency shut-off switches are (electric or other). Locate power lines to avoid problems. 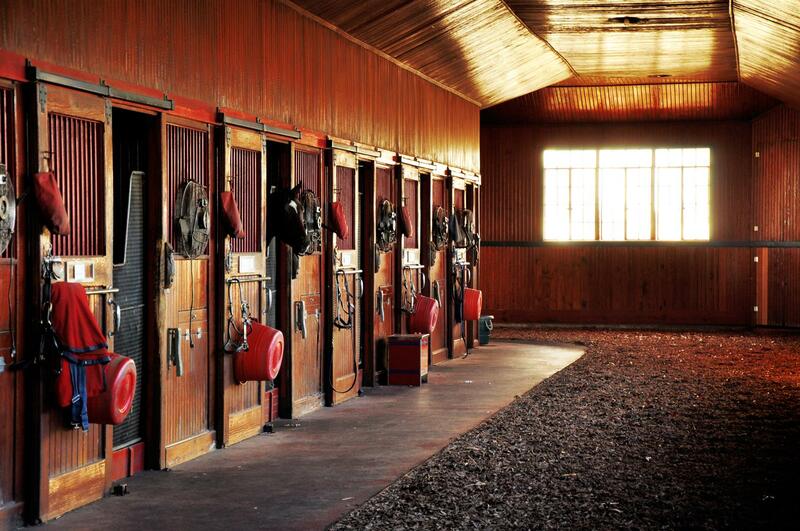 Keep exits clear and unblocked; keep barn aisles free of clutter. If there are multiple buildings, be prepared to clearly describe each building for emergency responders. Consider making rough maps ahead of time to assist. Clear the vegetation immediately around the building. Is hay stored inside the barn? Make sure it’s dry and in a well-ventilated area. Consider storing hay and shavings outside the barn. Have fire extinguishers available and make sure their inspections are current. Make sure everyone knows where they are and how to use them. Post “no smoking” signs around the barn and make sure they are enforced. Leave a 2’ clearing on top of anything stacked to allow water to cascade over it. Store chemicals and gasoline outside the building. Keep heaters at least 4’ away from combustibles. Inspect box fans. Make sure they are clean and cords are intact. Turn them off when not in use as motors can overheat. Check rating so the proper ones are being used. Keep a halter and lead rope at every stall. Make sure everyone knows the address of the property. Clearly state what the emergency is. Give them your name and the number you are calling from. Provide information with regard to how many animals and what type are inside. Describe what else is inside—vehicles? Flammables? Equipment? Tell them of any conditions that may interfere with emergency vehicles—muddy fields, fences, narrow driveways, etc. A list of emergency numbers for vets, boarders, etc. Please note that the information provided is intended for general informational purposes only. For more information about Markel, visit markelinsurance.com or facebook/MarkelHorse or call 800-794-6773. This entry was posted in Education, Horse Health, News and Announcements on March 26, 2018 by ludlumfarms.